After being driven from his land by drug violence, a cocoa farmer partners with TechnoServe to create a fresh, sustainable future. 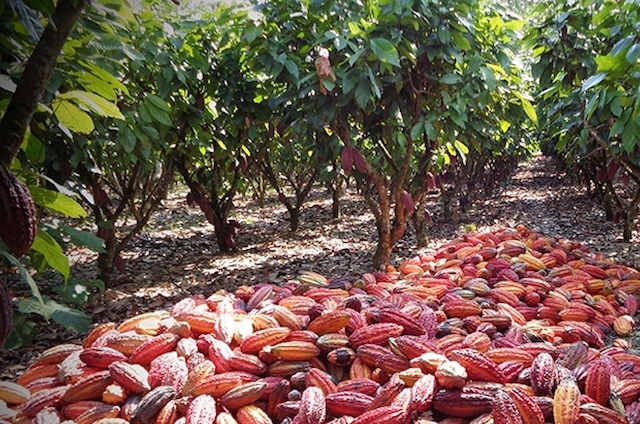 Ignacio Pascal Alarcón wanders through his cocoa farm, inspecting his flourishing crop. He runs his hand over the trees and colorful, glossy pods growing from their trunks. At age 66, he is now an experienced cocoa farmer in the Huánuco region of Peru, and it is hard to believe that he had no knowledge of the fruit when he first began producing it. 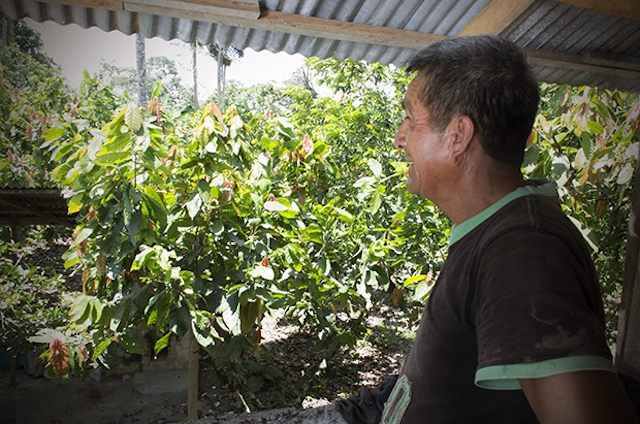 Of his 14 years as a cocoa farmer, Ignacio has spent the last four working alongside TechnoServe. 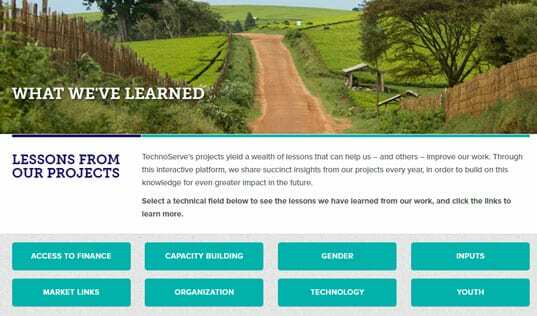 Thanks to the training he has received with TechnoServe, he has turned his farm into a successful enterprise, beating out obstacles such as pests, low yields and the coca trade. In fact, Ignacio’s agricultural roots started in the 1970s when he grew coca leaves, the region’s most viable cash crop at the time. After being forced off his land due to drug-related terrorism, he tried hard to stay afloat, working in factories and hoping to one day reclaim his land and his livelihood from the violence. Finally, in 1998, Ignacio recovered 40 hectares of his land near the town of Los Cedros, located in the Rupa Rupa district of Huánuco. Looking for a fresh start, Ignacio sold this plot, instead buying a five hectare cocoa plantation in a more central area of the countryside. 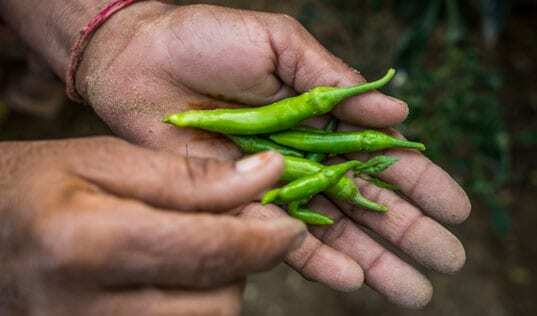 The sale of six chickens allowed him to invest in 1,300 seedlings, which he cultivated with the help of government technicians helping farmers to transition from coca to cocoa. However, without the necessary technical knowledge, there was still a long road ahead to making this transition economically sustainable. Thinking back on this new beginning, Ignacio remembers, “at that time it was very difficult to start over with an alternative product because the main industry was still coca cultivation and the drug trade.” Nonetheless, he stuck with his seedlings. Ignacio’s resolve was further tested by the physical environment. For 10 years his yields were low, ultimately dipping down to 50 percent production due to disease and insects. One of his chief obstacles was Carmenta, a species of moth that bores into cocoa pods, which caused him to lose 70 percent of his plantation. Thanks to the training he has received with TechnoServe, Ignacio has turned his farm into a successful enterprise, beating out obstacles such as pests, low yields and the coca trade. However, Ignacio’s perseverance paid off in 2012. He began working with TechnoServe’s San Martín Economic Development Alliance, which was implemented that year to help cocoa farmers increase their yields and incomes. He attended TechnoServe training on a specialize fertilization and pruning technique developed by the project, called TAPS, and TechnoServe specialists also visited his farm for personalized training sessions, helping him to analyze how he could improve his production. 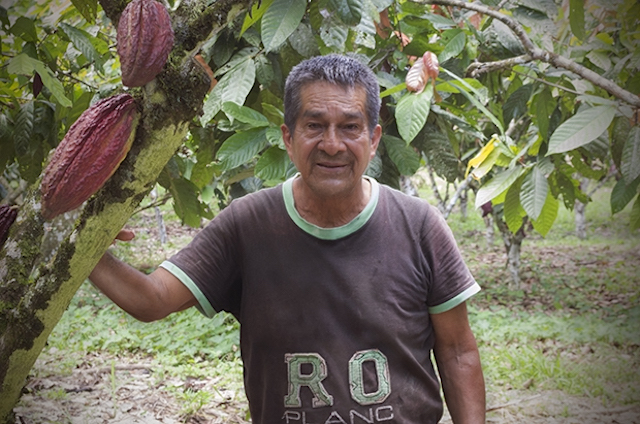 While Ignacio’s farm previously produced between 200 and 300 kilograms of cocoa a year, he was able to harvest 1,200 kilograms after implementing TAPS on his farm. The training also helped him to effectively avoid the pests that previously attacked his crop. He has now nearly tripled his yield, and has further increased his revenue by selling the unfermented beans in their pulp. This increased income has allowed Ignacio to improve his lifestyle and home, buy a motorcycle for transportation and help out his grandchildren financially. These days, this farmer’s vision is to continue working and improving. He has set a goal to produce 2,000 kilograms of cocoa per hectare each year, and he plans to invest those profits in real estate – buying a house in the city of Huánuco that he could then rent out as an additional source of income. In the meantime, Ignacio wanders his land with pride and purpose, showing off the cocoa fruit that will be collected in the next harvest.